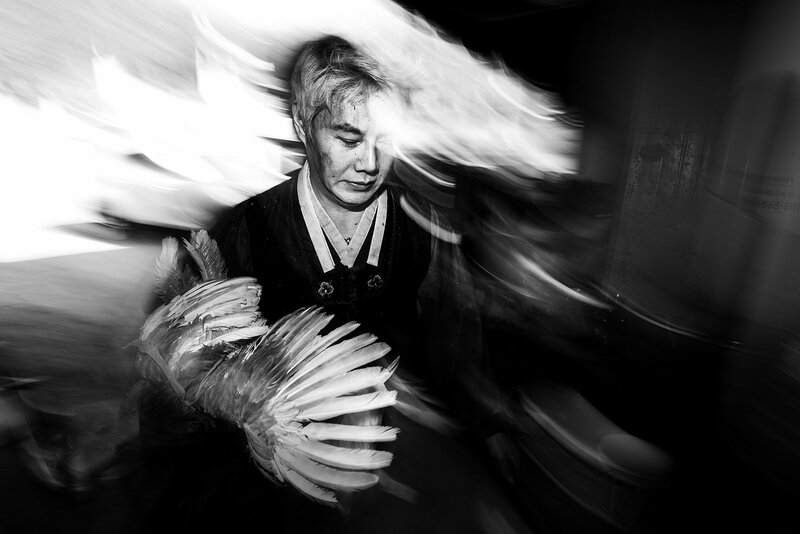 The photos of the exhibition “spirit contact – 접신“ show Korean shamans of the Hwanghaedo tradition in liminal moments. Liminal moments are periods in which they experience ecstasy and trance because they seek contact with spiritual entities or are incorporated by gods, spirits or ancestors. They are in an intermediate position “betwixt and between” that is very difficult to describe and as a matter of fact is experienced in a manifold of ways. The power of visualization seems to help where words fail. 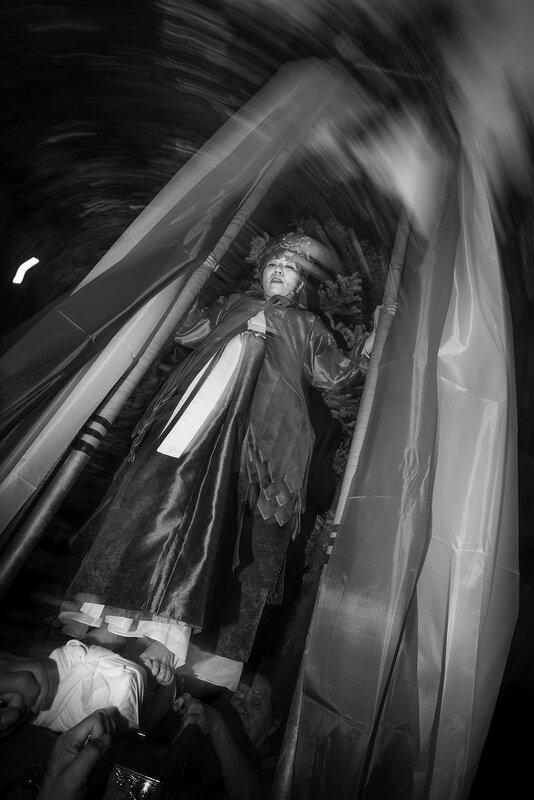 So my photos show shamans, when they experience intense moments of altered states of consciousness during rituals. My vision is using photography to express something otherwise invisible. 이번 전시회 “접신”의 사진들은 황해도 전통을 이어받은 한국 무당들의 리미널리티적 순간을 보여준다. 리미널리티적 순간이란 무당들이 영적 존재들과 접촉을 꾀하거나 신, 정신 또는 조상들을 자신의 몸으로 받아들임으로써 경험하는 엑스터시와 황홀경의 순간을 말한다. 무당들은 이때 이도저도 아닌 중간적 위치에 놓이게 되는데, 이를 설명하기는 매우 어려우며 실제로 굉장히 다양한 방식으로 나타난다. 언어로 설명이 불가능할 때 시각화가 힘을 발휘한다. 나의 사진들은 무당들이 제의를 치르는 중에 의식의 변용 상태를 경험하는 강렬한 순간들을 담아낸다. 나의 목적은 다른 방식으로는 보이지 않는 것을 사진을 사용하여 표현하는 데에 있다. Bio: Dr. Dirk Schlottmann is an Ethnologist, Visual Anthropologist and Photographer. 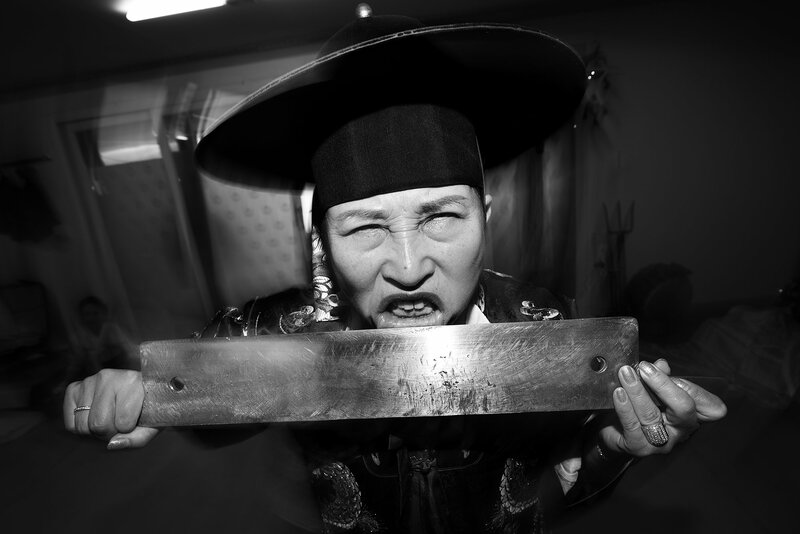 After living, working and researching for 10 years in Korea at several universities, he currently lives in Berlin, where he founded the Institute for Korean Shamanism. Dr. Dirk Schlottmann has conducted fieldwork and research in South Korea, Thailand, India, Indonesia, the Philippines and Germany. His interests range from the very specific investigation of spirituality in East Asia and ritual theory, to researching cultural development and change in modernity. 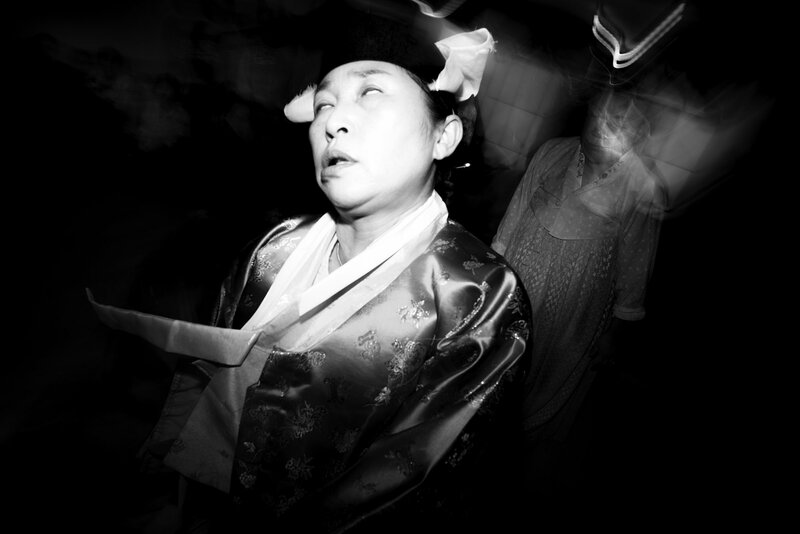 The photographic work circles around Asian spirituality, religious culture and altered states of consciousness (trance, ecstasy and spirit possession) and centers essentially on the relation between man and the sacred. 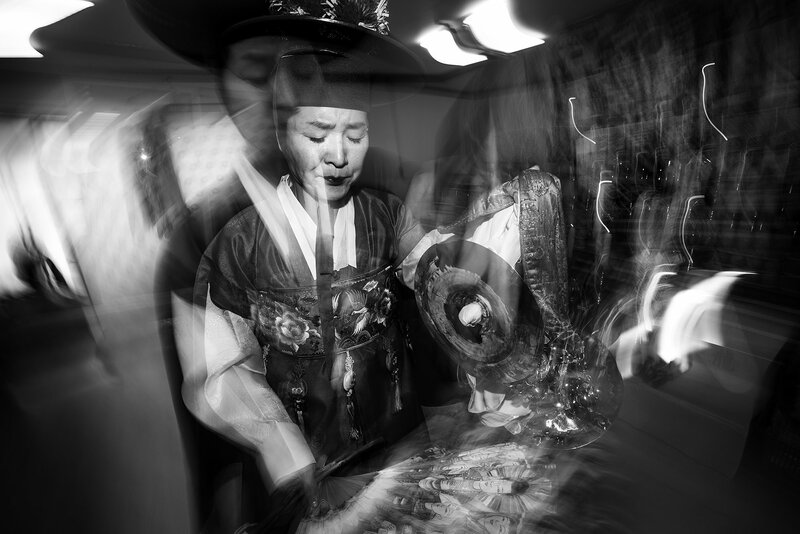 “Korean Shamanism” is a long term project since the beginning of the Millennium. The goal of the project is to give an impression of ecstatic rituals, ceremonies with elements of trance and shamanic practices. His doctoral thesis on Korean shamanism is, in German-speaking countries, regarded as a standard work on modern Korean shamanism. You can see more of Dr. Dirk Schlottmann’s work at his website Photoanthropos. Thank you for being apart of our community. If you enjoy our content, please take the time to donate whatever amount you can spare. This amount goes back to web hosting, exhibitions, and all the other boring what not that keeps us running. Please use the dropdown menu and choose custom to pay for your submission to our upcoming exhibition. The total is $35 for 5 prints and frames.